The demographic challenge: "New Germans? We'll make them ourselves." On Saturday night, at the end of a speech on immigration, I was asked by a lady in the audience about Sunday's impending election in Germany. She had met a young Teutonic chappie who said he was voting for Angela Merkel, and she couldn't understand why. And I said that Frau Merkel was certain to win the election, but what would be important to watch would be the respective strengths of the losing parties: my questioner's chum was voting Merkel because he feared the rise of the "far right" - ie, AfD, Alternative für Deutschland - but I suggested that AfD would do better than expected. That was a rather boring and cautious prediction, but the post-Nazi complex proportional-representation electoral system was designed by the Allies specifically to produce boring results, and to make anything non-boring all but impossible. And by those standards Sunday was the biggest stunner in seventy years. First of all, a dominant political figure is no longer such. You need an estimated 355 members (depending on the number of "overhang" seats - please, don't ask) for a majority in the Bundestag. Previously, Mutti Merkel's Christian Democrat/Christian Social Union had 311 and so governed in a "grand coalition" with the Social Democrats - or "GroKo" (a neologism coined by abbreviating Große Koalition). This is the equivalent of a Republican/Democrat coalition in Washington, or a Tory/Liberal coalition in Ottawa, or Tory/Labour in London, Liberal/Labor in Canberra: It's essentially a two-party one-party state. Regardless of which of the two potential governing parties you vote for, you wind up with the same left-of-center/right-of-left-of-center coalition. This cozy establishment partnership had governed in Germany for eight of the last twelve years, but it is not a symptom of a healthy stable democracy: "GroKo" isn't merely short for Große Koalition; it's also short for "There is literally no alternative". On Sunday GroKo fell apart. Before the election, the "grand coalition" held 504 of the 598 seats plus the then 33 "overhang" seats (again, don't ask: it'll make your head hurt). Today it's down to 399. Both major parties - Angela Merkel's CDU/CSU and Martin Schulz's SPD scored their worst results since the foundation of the German Federal Republic in the rubble of the Third Reich. Frau Merkel lost 65 seats and Herr Schulz 40. The latter has said that the SPD will not be part of any new government. So GroKo is over. Meanwhile, having been told there is no alternative, German voters went looking for one and found Alternative für Deutschland. 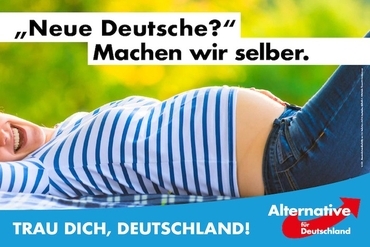 Founded a few months before the last German election, AfD has all the problems that any new party attracts in democratic societies, but it fought a nimble election campaign, with witty and effective advertising. The poster of two lissome lovelies in swimsuits with the tag "Burqas? Here we prefer bikinis" attracted most attention, and caused a fit of the vapors on this side of the Atlantic among the pearl-clutching pajama boys who police American progressivism. More telling was the poster above, an explicit rebuke to Mutti Merkel that all these strapping young "Syrian" "teenagers" were needed because of Germany's collapsed birth rates: A pregnant woman accompanied by the slogan "New Germans? We'll make them ourselves" - which, indeed, is the only solution to the problem that doesn't involve the utter extinction of some of the oldest nations on the planet. Nevertheless, Vox pronounced that this poster was straight out of Margaret Atwood's Handmaid's Tale: To the nincompoops of American liberalism, the party that doesn't want women hidden away in faceless, anonymous body bags is the harbinger of the new patriarchy. The reaction of the German establishment was even loopier. The former leader of the Social Democrats, Sigmar Gabriel, warned that "for the first time since the end of the Second World War, real Nazis will sit in the German Parliament". AfD has some coarse types among its membership, but, even down the murkier end of the batting order, they're not actually Nazis, and demonizing their voters will not work. Last year I spoke to dozens of women who had either been sexually assaulted themselves (in Cologne and elsewhere) or had their daughters assaulted (in public swimming baths) by "refugees". None were "right-wing"; almost all were liberal and thought of themselves as such. Yet a significant proportion told me they were considering voting AfD because every other party denied there was any issue here, and were insistent, as are the likes of Herr Gabriel, that you can't even talk about it. So, if you can't talk about it, best not to talk about it next time the pollster asks who you're voting for. Hence the now familiar phenomenon of the "unacceptable" party outperforming its pre-election polls. The shut-up crowd learn nothing. Anti-AfD protesters were out in the streets last night shouting down the new Nazis - which seems a pretty sure bet to intensify the phenomenon of "shy" AfD voters, and accelerate the divisions between West and East Germany. It is not a sane or prudent response to what ought to be a sobering moment for GroKo types: A party that did not exist until four years ago is now the third largest in the Bundestag with 94 seats. Below them, Germany's traditional third party - the Free Democrats - were pushed into fourth place, and "the Left" (an admirably straightforward party name) and the Greens make up the rest. That's another reason why the SPD has announced they're out of the grand coalition. If Germany were to remain governed by a Merkel/Schulz GroKo, the next largest party in the Bundestag gets to be the Official Opposition - and that would be AfD, and nobody in Berlin's establishment wants to normalize AfD any more than Sunday's election results did. As that young German lad told the lady who asked me the election question, he was worried about the rise of the AfD. So he kept a-hold of Nurse - but two thirds of his countrymen did not. Just to be clear on that, Trump's lousiest approval ratings are more than the percentage of German voters who backed Merkel. Where did their votes go? The AfD got just under 13 per cent, which by comparison with, say, the SPD's 20 per cent is pretty impressive. But these tallies were not evenly distributed. In the former West Germany, AfD got about 11 per cent, which is a good result. In the former East Germany, it got just under 22 per cent, which is a spectacular result. AfD came second in East Germany, and, among East German men, first. So a united Germany is now a microcosm, within a supposed single state, of the broader split within a supposedly united Europe: Just as western EU politicians are still hot for "refugees" and ongoing Islamization, eastern EU politicians are implacably opposed. Germany mirrors that same division. Things will ebb and flow in the coming electoral cycle, according to how explicitly suicidal Frau Merkel et al make their immigration policies and how many trucks and vans the more excitable Mohammedans are willing to plough through the sidewalks of Berlin, Nice, Barcelona, Stockholm, London and wherever's next. But this issue is not going away, because it's an existential threat: One reason why East Germany, and Hungary and Romania and the rest, managed to endure Nazism, fascism, Communism and the other hellish perversions of the 20th century, is that through it all they retained at least the consolations of culture. Islamization denies them even that. If the political culture forbids respectable politicians from raising certain topics, then the electorate will turn to unrespectable ones. East Germany has already turned. If you don't want others to join them, you need to provide an alternative yourselves. ~We had a busy weekend at SteynOnline. If you missed Mark's analysis of the Obama Administration's conscious subversion of its successor, or (on a cheerier note) his twentieth-anniversary observances of LA Confidential and his celebration of two great ballads, we hope you'll want to catch up with some or all of them. For another perspective on the consequences of Islamization, Mark's trip to Northern England to meet "grooming" victims is recounted in the current issue of The Clubbable Steyn, which comes free with membership in The Mark Steyn Club: You can sign up for a full year, or, lest you suspect a dubious scam by a fly-by-night scamster, merely a quarter. And don't forget our new gift membership for a friend or loved one. Among the other benefits of membership is our series of audio adventures, Tales for Our Time - and the thrill of clobbering Steyn by logging-in and commenting below. For more on The Mark Steyn Club, please see here. Watching Germany implode is never pleasant. Frau Merkel should have quit while she was behind. The Germans are so afraid of having a real leader (with their bloody past) that they have glorified an accountant into a Chancellor. Hitler was a Major in the Great War, a tax dodger and overall fraud. Then the mass murder started. And the Germans are still running from that spectre -- with Merkel spouting virtue-isms like they care about feeding starving Syrians. Somehow, with the German "leader" it's always about the stomach being fed, the meal ticket being punched. This "Stop Us Before We Kill Again" EU strategy (The Germans Get to Be the Bankers) has flopped too. The former Soviet-block countries, and Poland in particular, can only become stronger and more the future of Europe. this is not an ad... but a suggestion of a FREE book in the same vein. On a European note I wonder if Mark has ever heard of Hamida Djandoubi, the last man executed in France was a Tunisian immigrant who murdered a young woman he was trying to force into prostitution. He was also trying to force a couple of minor girls into prostitution and made them witness the torture of the murdered woman in order to intimidate them. Mark, can you please tell me if there were other incidents like this, or is the first and only Muslim man behaving this way until the recent immigration onslaught? I've been travelling through Central Europe and watched CNN from my hotel in Prague-you'd think the world just ended. They were absolutely incredulous that such a big percentage of Germans would support the Nazis once again. Hatred and bigotry and divisiveness...I thought to myself it's the same BS I saw with the Trump election. I'm certainly not familiar enough with AFD to intelligently comment, but obviously the German voters were fed up with the 'respectable' politicians. Anyone sensing a trend here?? Watching CNN International is quite the eye-opener. In "America Alone," Mark himself wrote that CNN International makes CNN (America) look like the 24-Hour Michael Savage Channel. I puzzled over why the SPD announced it would be leaving the coalition; was there some falling out between Merkel and Schulz over election strategy or policy? Were Schulz and the SPD bowing out because of embarrassment over losing 40 (!) seats? No, the reason has been precisely identified by Mark: if the SPD stayed in the coalition, the AfD would then, as the third largest party, be the "Official Opposition" in the Bundestag, which would bestow open them a status every other party wants to deny them. So, out of the coalition, the SPD as the No.2 party, becomes the "Official Opposition": opposing parties it has just been governing with for 8 years. Cute. It makes a mockery of parliamentary government as one can just envisage how hard the SPD will be hammering away at Merkel's government. "To the nincompoops of American liberalism, the party that doesn't want women hidden away in faceless, anonymous body bags is the harbinger of the new patriarchy." Perspicacious. And this patriarchial party planning to introduce a "Handmaid's Tale" regime has a lesbian as its co-leader and two other women, Frauke Petry and Beatrix von Storch, in its top circle of leadership. Helluva patriarchy! The only reason I can name a single other top AfD male leader is because he recently partnered up with Petry. Just to be sure I have this right, Germany atones for its genocide against Jews by welcoming Muslims into their country, thus making Jews feel safer and more comfortable? About as plausible as a secretary of state selling Russia ten percent of the U.S.'s uranium reserves and when she loses the presidential election it's her opponent who's accused of having ties to Russia. We are going to see the situation in Germany and in the other (so-called member states) getting really nasty. of which tried to maintain some kind of stability without success. Of course we don't see hyper - inflation as we saw in 1920s Germany, YET. Socialism owns Germany and Europe and the EU elites are showing no flexibility. Every law; every directive must support a federal EU with one anthem, one law system, one army,one economic system. The Chinese philosopher, Tsu said that" those who make peaceful revolution impossible, make violent revolution inevitable". I think you're right, Mark. If the state " prevents respectable politicians from raising current topics, then the electorate will turn to un-respectable ones". I don't think that the Afd party is in that category but if the latter is brow-beaten, then a more desperate and aggressive version could well rise up. Wow, is the old Iron Curtain creeping back, except this time to stem an unwanted flow from the opposite direction? Another well thought out piece. More than any other present pundit/pol/prominent figure, Mark just understands the times. No one else seems to, they all seem to view this as a game where they are hoping their side wins. And that's just pathetic. Well done, Mark, well done indeed. I keep reading in US and UK papers about the "far right" party in Deutschland. I seriously need someone to tell me what "far right" means. Am I "far right" because I want to be left alone? Or is it something more sinister. It seems that AfD just wants to have a place for Germans to live as Germans. the AfD has some unsavoury characters, including the one of its current leaders, Alexander Gauland, who recently said Germans should be proud of their WW2 soldiery, and that Germans have done enough penance. It could have been qualified, such as we should be proud of 'some' of our soldiers. As well, while I might think perhaps they have done enough penance, it should be others, preferably descendants or relatives of their victims (as many do not, because of the Germans, have any descendants) who tell them they have done enough. Arrogating to oneself the right to decide when your nation has done enough to recompense the murder of millions is ugly. Better to just STFU and talk about something else, no? Steyn is also exactly correct (as usual) that the reason these ugly types come out of the woodwork during times like this is because the mainstream politicians choose not to broach certain subjects. While our politicians are guilty of the same diversionary tactics, we are lucky in the USA, as we got Trump instead of, who is a man of many personality faults, but who is no Nazi, despite what you hear on TV. Also, I recently met a couple of ex-East Germans on a long Luftanza flight back to the USA. We had a chat. The ones I met, in first class (I was bumped up), were a pretty coarse, opinionated bunch. No doubt they did not share all their opinions. The AfD is more popular in eastern Germany (20% vs 10%, or close to). East Germany never underwent the introspection, deNazification, and wealth creation of w. Germany, and I would say it shows. Patton was keen on using the German soldiers after they were captured, so why wouldn't Germans be proud of them? Mine has been a two-party preference for decades. Most probably because that is pretty much all I heard when election day rolled around - are you a Democrat or a Republican? Seems that it has worked - perhaps not as well as many would like, but better than the so-called coalition building that goes on and on in the majority of other western-world-nations. I have no dog in the hunt regarding Germany's recent election nor in their politics. I also detest outsiders venting their oh-pin-tuns regarding my country (USA) and its politics. Having said that - here it comes - why not term limits for the top leadership? New blood with new ideas seems refreshing, n'est ce pas? Such strange times. Our elite rulers refuse to discuss the real enemy in simple and truthful words, but they don't hesitate to engage in the most extravagant hyperbole in an attempt to discredit their political opponents. This is a formula that ensures they will ultimately isolate themselves from the electorate, ridiculous paragons of your alternate reality. I see elsewhere that that the AfD is accused of being anti-Semitic. Is there any truth to this? Frau Merkel's numbers are far worse than suggested, it is the sum total of two parties: Merkal's own CDU and Bavaria's CSU. On her own, I doubt whether Merkel can even match Social democrats. "The shut up crowd learn nothing." Amen to that. It's a somewhat peculiar reaction to hear about the rise of "new Nazis" in Germany and shrug it off, but as a wise man once said, if everybody's a Nazi, nobody's a Nazi. Add it to the list of terms that the left have completely sapped of all meaning. Succinctly put. This is similar to the American leftist view that if Trump can be thwarted the people have no alternative but to vote Democrat. Really? An electorate that insists the political elite need to act as the people demand will turn to a party that specializes in using bureaucrats and judges to jam its program down our throats? I think it's more likely the voters will find new alternatives to the elite in both parties. Mark, don't you think that Germany is actually finito? Is their decline reversible? It seems as though a majority of Germans have accepted their fate as providers of child sacrifice for diversity's sake, and to becoming an Islamic country. I've seen nothing that indicates that regular Germans are resisting in any meaningful way-or perhaps the cult of the state has just become too powerful for the citizenry to overcome. They can't talk about anything nowadays with the Big State censorship and the collusion with social media giants. "Everywhere he goes, people tell him the same thing: that Chancellor Angela Merkel famously invited in more than one million migrants in order to erase the moral stain of Germany's Nazi past. He concludes that this was not an act of conscience. How could it have been when these people have been left so abandoned? It was instead a move to show the world — and themselves — that this former Nazi state has become the world's conscience. In other words, it was a cynical move that evacuates the word conscience of all meaning." "Worse than that, Tenenbom also discovers that this public advertisement of collective "conscience" has legitimised and provoked open antisemitism. Repeatedly and gratuitously, Germans tell him that they are now morally superior to the Jews and to the State of Israel which is described as uniquely racist and murderous." Would be interested in hearing your thoughts about why this is Germany's choice.